Posted on November 18, 2014 at 4:40 pm. By Greg Harrison, creative director, Playworld Systems, Inc.
Today’s kids get 50% less unstructured outdoor playtime than those in the 1970s. Trends driving this shift include the over-scheduling of kids’ lives, security concerns and screen time. Without play, children’s cognitive development and socialization suffer. At Playworld Systems, it’s our goal to save unstructured outdoor play. Kids have limited time for free play so we must value and make the most of it. Play promotes spiritual development and reduces stress, and obesity. It also unites and strengthens our sense of community. 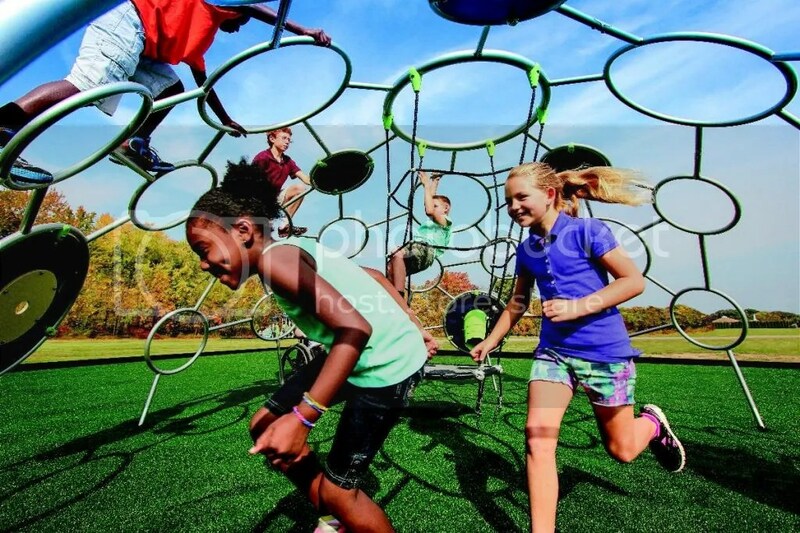 As a leading manufacturer of playground equipment, our vision is to reinvent unstructured outdoor play. We hope you’ll join our mission to #SavePlay. Check out our Save Play video. Posted on October 25, 2014 at 4:25 pm. Play comes naturally to children in the primary grades, but as students mature, attitudes toward the type of play they formerly enjoyed begin to change. Nowhere is this more evident than when comparing a middle school campus with that of an elementary school campus. Gone are the swing sets, the slides, the jungle gyms – replaced by sports fields used only by athletically-inclined students. Gone, also, is much of the spontaneous physical activity that keeps younger children so healthy. For the students who do not go out for sports, enticements to physical activity suddenly become very few. Educators face a challenge with the middle and high school set: How to encourage the same type of playful activity in youths who have moved beyond the playground? Schools across the country have turned to outdoor fitness equipment in recent years. The structures, in some ways reminiscent of playground equipment, encourage playful activity in older children in a social environment that makes fitness fun. Schools typically employ the exercise units during PE classes, but also make them available to the students before and after school and during breaks. Terrace Community Middle School in Thonotosassa, Florida employs its outdoor gym for PE classes, a practice that teacher Vivian Canaday says has been a great option for the students. “It makes it enjoyable for them. They don’t realize that they are … getting some exercise because they are actually having fun,” she says. A high percentage of students lack the upper body strength to do exercises on static units, such as pull-up bars. Therefore, to meet students on their level, schools have found body weight leverage resistance units as an effective alternative. Canaday says this type of equipment allows every student, regardless of fitness level, the opportunity to participate successfully. A wide variety of equipment allows for not only upper body exercises, but also includes activities to strengthen the core and lower body, increase cardiovascular health, and provide for stretching. Students participate in groups – and many exercise units allow for several students to use them at one time. In this way, the exercise incorporates more of a playful element, giving students additional motivation. “They challenge each other to see who can go longer on some of the equipment. It gives them a whole new view of different fitness activities,” she says. Schools incorporating outdoor fitness equipment on their campuses often choose to extend the benefits to the greater community as well by designating the zones as joint-use areas. As a result, the benefits of playful fitness are extended to not only the students, but to adults as well – who often are in just as great, if not greater, need for physical activity, and who may not be able to afford gym memberships. Palomares Academy in Pomona, California is one such example. A joint project between the Los Angeles County Department of Public Health and the Pomona Unified School District, the fitness zone of 16 units allows for at least 28 students to participate in fitness activities during PE classes – and it also provides a fantastic opportunity for families in the area to enjoy exercise together after school hours. By combining play with fitness, this unique concept has been gaining popularity nationwide and proving that play is a key to fitness not just for young children, but for teens, adults and beyond.